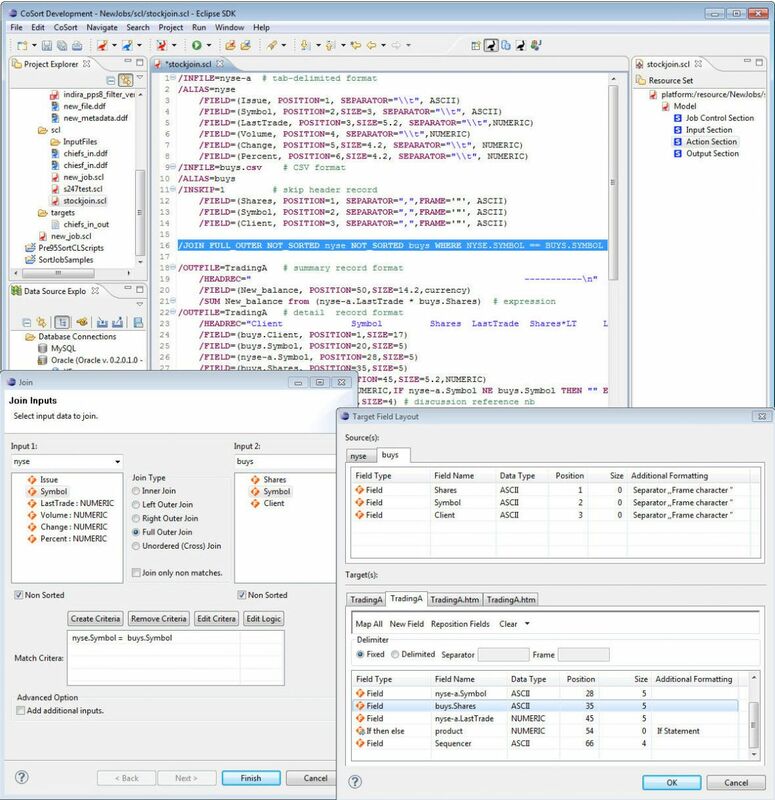 IRI Workbench leverages several job presentation facilities within Eclipse to make the design and modification of IRI CoSort SortCL jobs easier. Workbench interacts with SortCL scripts dynamically, and interchangeably, so you can define and modify them in the graphical mode you prefer, and have those changes reflected in their persistent metadata model. New job wizards can take you from source and metadata specification, through the action phase of a job, and then specification of one or more targets and formats. Wizards, dialogs, and diagrams can help you populate and modify SortCL job scripts. The GUI's syntax-aware script editor also supports valid job creation and change. The top window in the figure below shows the editor view of a join job script. Invoke the join wizard (shown in the bottom left) from the main menu or from the script editor. Specify the details of a multi-source join. Data sources (shown in upper tabs) and targets (shown in lower tabs) are displayed in the output field editor. Easily define data mapping and precise target layout definitions on the fly.